This conference took place at the Muzeul Judeţean Teleorman on the 3rd, 4th and 5th Noiembrie 2010. The conference addressed the different ways in which the prehistoric landscape has been changed and the social implications of those landscape changes. Change can be caused by people and by the environment. Change can also be recognised as the different perceptions or ways of thinking about the landscape. Landscape is a broad concept that has been defined in many different ways. Landscape can be defined in physical, economic, human, philosophical, sensual, and (even) mystical terms. The scale of landscape can range from the very large (the Bulgarian-Romanian Danube region) to the very small (one pit in one site or one event at one prehistoric moment). 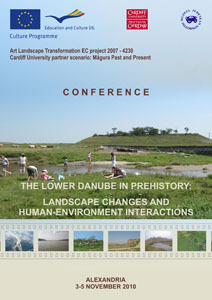 In this conference, participants are invited to explore landscape changes of the Lower Danube in prehistory. Chronologically, this includes any period that precedes the end of Bronze Age. Geographically, this includes the Lower Danube catchment. Conference topics included the following: settlements and human-built environment, paleoenvironmental reconstruction, cultural change and interactions, landscape and funerary space, seasonality and subsistence, raw material sourcing, landscape and advanced techniques in archaeological survey. The conference attracted 36 specialists (archaeologists, archaeozoologists, geomorphologists, and palaeobotanists) from Bulgaria, France, Great Britain, Romania and the U.S.A. met in the Alexandria Museum. The participants gave presentations that focused chronologically from the Neolithic to the Bronze Age and geographically throughout the Lower Danube Basin, both north and south of the Danube and including the Danube Delta and western Black Sea coast. Please visit the Media-Resurce section to view the conferinţa program [pdf, 2mb] and conferinţa proceedings [pdf, 19mb].